Made of very fine porcelain by Hallmark cards, this plate would make a lovely gift for your grandparents who are celebrating the big one! 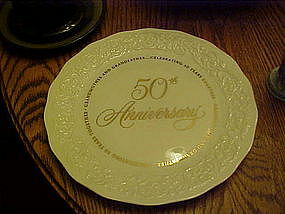 A celebration of grandmother and grandfather's 50 years together. On the back side it reads" Grandmother and Grandfather... "It means so much to have grandparents like you. You are a wonderful example of how love can grow stronger and more beautiful with the years. May this golden anniversary be a happy celebration, and a happy tribute to your special love". Now thats a nice sentiment!! Pristine condition!